Imagine you are Pierre. You came from the Congo 10 years ago and live in Nakivale camp. You’re a hardworking shop owner and it supports your family, but you’re looking for a loan to expand your business. Yet the nearest bank branch is 10 km away. And you have an expired ID. Imagine you are Valarie. Originally from Burundi, 8 years later you run a fabric and hair business in Kampala. You want to open a physical store and expand to sell in neighboring countries. You’ve been a consistent savings-group member but need more capital. Yet when you’ve gone to banks for a business loan you’ve been denied not once but four times. These are two of the refugee personas that BFA shared to bring to life the everyday activities, aspirations, and struggles of FDPs. In our workshops, these insights helped providers address key questions, debunk myths, and begin to think of refugees not as problems or edge cases, but as new valued customers. Building on this foundation of awareness, how might we help FSPs apply these learnings to improve their offerings and better serve refugees? Some of their staff had already visited the camps and many were passionate about both the social and business impact they could achieve with this new customer segment. Yet many questions and challenges remained in bridging the gap between insights and ideas for action. To address this, BFA facilitated a Journey Mapping exercise. Also referred to as Experience Mapping, it is a Human-Centered Design method that visualizes and synthesizes a person’s experience of a product, service, or business to communicate insights and takeaways, as well as guide areas for improvement and action. 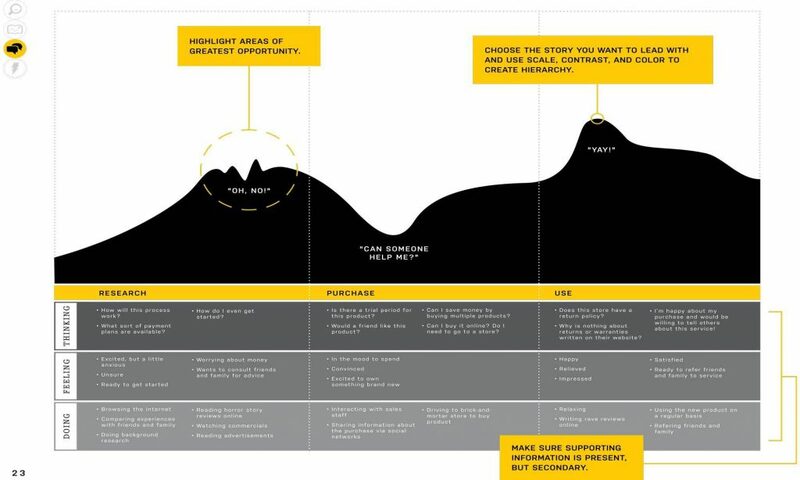 BFA’s journey-mapping exercise was based on its extensive experience in service/UX design and utilized a library of resources shared by social impact design firm AdaptivePath.org. 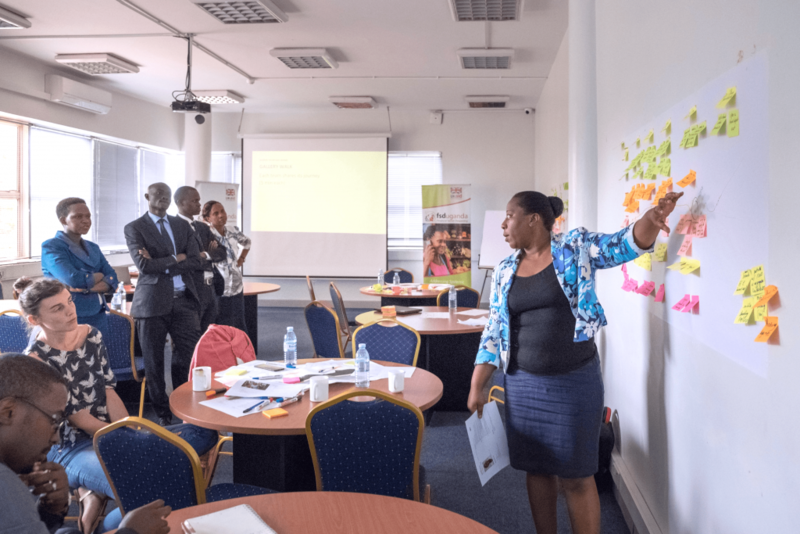 As a method, journey mapping allows users to understand a product/service experience from the perspective of the refugee and to assess the product holistically across channels. By understanding the conditions, capabilities, needs, and motivations of the refugee customer, we can imagine how they may first discover a product/service, what types of interactions and channels are relevant to them, at what point the customer realizes benefit from the service, and when the customer adheres to a new behavior and is converted to a service over a longer term. Doing: What actions do refugees take to meet their needs? What are their key behaviors? Thinking: How do refugees frame and evaluate their experience? What are their expectations? Feeling: What emotions do refugees have along their journey? What are the high points of the experience? The low points? In addition, what channels are relevant to refugees, i.e., are they best reached through radio, print, word of mouth, Whatsapp, social media, and what are the key touchpoints of interaction, e.g., an agent, when receiving a disbursement or remittance, at a settlement service point, etc.? The FSP participants looked at each building block and mapped them over time in a highly detailed process. After identifying the different building blocks and looking at them all together, it formed a powerful picture of the refugee’s experience through the refugee’s eyes. This enabled us to take each step in the shoes of Valarie or Ayak or Pierre. As we did so, we uncovered pain points that may have seemed small from the perspective of a financial service provider. But with greater empathy for the refugee, we could see how they quickly become demoralizing impasses and drop-off points for someone who had been forcibly displaced. For example, trust was a major theme that came up. Fears and negative experiences with banks for some refugees may mean they will not trust a new FSP. How could we ensure that refugees feel comfortable, welcome, and supported as they sign up for and begin to actively use a new provider’s products? How could we ensure that a provider’s agents and staff can speak to refugees in their native languages to maximize accessibility and build more trusted relationships? How could a provider increase their touchpoints and networks so refugees in remote settlement areas don’t have to walk 10 km when they have a question or a problem? As a finishing touch, the teams drew an emotion line or “mood meter” for the refugee’s journey, based on the building blocks they had mapped. They then chose the lowest emotional point in the journey to see how they might address the challenges embedded there. Each team came up with a range of ideas to solve the problems the refugee was facing there as well as at other pain points, including new types of awareness campaigns to offering financial literacy to getting mobile phones into the hands of FDPs in order to facilitate mobile banking. Nine (9) journey maps later… what did we learn? Before when I went to the [FDP] camp, all I thought about were getting deposits. Now, I think about solutions for their problems that also generate revenue. Now I don’t see cash transfer payment requests as statistics, they are actual people. Our intention was—without leaving Kampala—to encourage FSPs to walk the journey of the refugee, along with them, to better understand who they are, see the potential business opportunity, gain empathy for their lives and struggles, and to lay a foundation for a relationship based on trust and value. When FSDU shared its roadmap of interventions to serve FDPs in Uganda, each of the seven providers expressed interest and excitement, including visiting refugee settlements to continue the learning process and to further advance their development of refugee-centered financial services. Financial Sector Deepening Uganda (FSDU) is an independent not-for-profit company committed to promoting greater access to financial services in Uganda. FSD Uganda seeks to develop a more inclusive financial sector with a focus on low-income individuals (particularly women) and Micro, Small and Medium Enterprises (MSMEs). We support innovation, conduct research, help promote and improve policy, laws and regulation that shape the financial sector in Uganda. FSD Uganda works with both public and private sector players to develop sustainable improvements in the livelihoods of low-income individuals through reduced vulnerability to shocks, increased incomes and employment creation. FSD Uganda is funded by Department for International Development (DFID) UKaid and is part of a network of nine financial inclusion organizations working in the sub-Saharan region of Africa. BFA is a global consulting firm specializing in financial services for low-income people. Our approach is to seek out, create and implement financial solutions to help people manage challenges and seize opportunities. 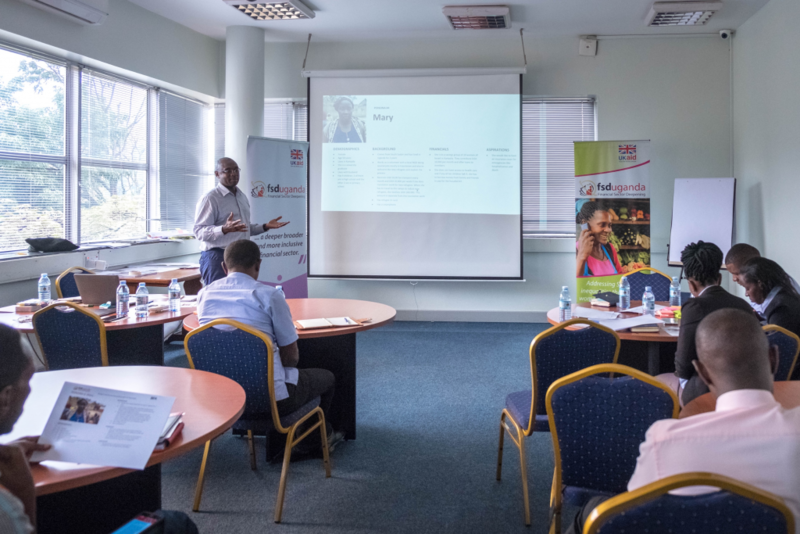 We partner with cutting-edge organizations that touch the lives of low-income customers such as financial institutions, fintech companies and information providers. In creating solutions, we integrate our deep expertise in customer insights, business strategy, new technology, and growth-enabling policy and regulation. Founded in 2006, BFA’s clients include donors, investors, financial institutions, policymakers, insurers and payment service providers. BFA has offices in Boston, New York, Nairobi and Medellín. For more information, please visit: www.bfaglobal.com.